Are you interested in creating unique, healthy and flavorful entrees, deserts and beverages? 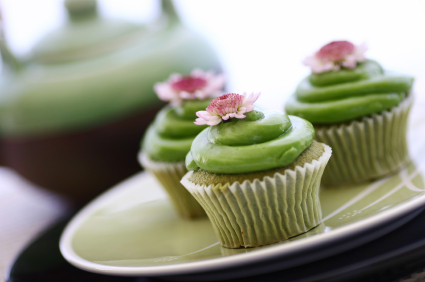 We’ve scoured the culinary world to bring you some of the best green tea powder recipes. As a general guideline, just about any desert recipe that calls for cocoa powder can be substituted with an equal to 2/3 amount of green tea powder. So go out there and explore the gastronomic possibilities! You’ll be pleasantly surprised with what you can come up with. Here’s a little tip… Want to dress up your green tea desert? Create a stencil and dust green tea powder under or over your desert to instantly elevate the presentation of your creation. Also, most green tea deserts look and taste great when garnished with a few pieces of candied ginger or dried sweetened berries or mint sprigs. Common food pairings with green tea are: seafood, poultry, salads and most fleshy fruits. Common ingredient compatibility with green tea powder in recipes are: lemon, honey, ginger, rice, cream, fish, chicken and sesame (but not all at the same time!). Typically, green tea powder can be used to balance out food that is high in sodium or sweetness while complementing delicate natural flavors. A great drink recipe for those hot summer days! Place all the ingredients in a blender. Start blender on low to incorporate ingredients and then blend on high until smooth and icy consistency. Add honey to sweeten if desired and garnish with a mint sprig and/or a chocolate syrup design. Thaw 1 pint of your favorite vanilla ice cream until pliable with a spatula. Mix 1 teaspoon of green tea powder into the softened ice cream. Refreeze the mixed ice cream until hardened. Serve ice cream with dusted green tea powder, white chocolate shavings, a couple almonds or pieces of candied ginger, chocolate syrup and garnished with a biscotto or lady finger. Did you know most instant green tea flavored drink powders contain very little green tea? In fact most brands contain more powdered sugar or artificial sweetner than actual healthy green tea powder. Here’s a great recipe to really enjoy the health benefits of green tea. Bring water to a boil, then add ginger and turmeric. Simmer for 10 minutes. Strain into a mug or pint glass, add green tea powder, maple syrup and lemon, stirring to combine. Pepper to taste and garnish with a mint sprig. Serve hot or iced. Combine all the ingredients in a blender and blend until icy. Serve with dusted green tea powder on top. Combine water, green tea powder, honey and juice in a pitcher. Mix until honey is completely dissolved. Add sparkling water for a little effervescence. Serve with ice and garnish with a mint sprig.